All BOERNE HOLLOW homes currently listed for sale in Boerne as of 04/20/2019 are shown below. You can change the search criteria at any time by pressing the 'Change Search' button below. "Meticulously maintained 4 bed, 3.5 bath w/ tons of upgrades built by DR Horton on huge .25 acre lot backing to open space! Tall ceilings, beautiful flooring throughout, large main floor master suite w/ 5 piece bath & custom closet, private study/home office w/ double doors, upstairs media/game room, beautiful granite kitchen counters, stainless appliances, gas cooking, spacious guest bedrooms, awesome new lights & ceiling fans throughout, epoxy garage floor, plenty of room for pool, walk to sch"
"5 BEDS, 3.5 BATH HOME LOCATED IN BOERNE ISD. 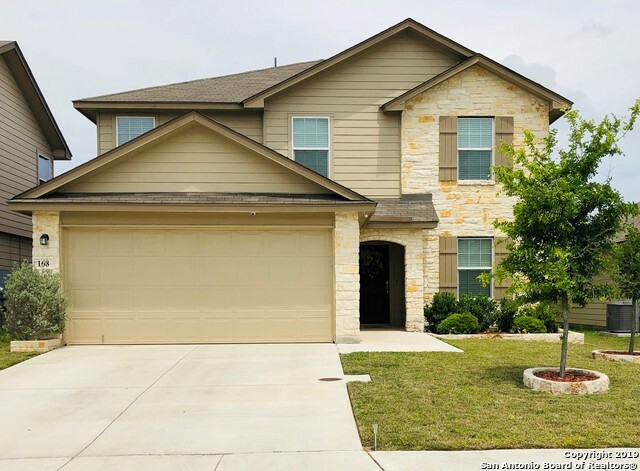 LARGEST FLOORPLAN IN BOERNE HOLLOW W/LARGE BEDROOMS, 2 LIVING AREAS, CEILING FANS, 2 BLINDS, GAS COOKING, GRANITE COUNTERTOPS, FRONT DOOR CO. FAUX WOOD ENTRY DOOR, SEC. SYSTEM W/CAMERAS, SPRINKLER SYSTEM, STONE PLANTING BEDS, PLUMBED FOR WATER SOFTENER. FORMAL DINING ROOM, BREAKFAST BAR IN KITCHEN. MASTER BEDROOM DOWN. GAME-ROOM/LOFT IS HUGE AT 25x16. JUST AROUND THE CORNER FROM KENDALL ELEMENTARY, BOERNE MIDDLE SCHOOL SOUTH & BOERNE AMC CLASSIC THE"
"One of the Best Locations in Boerne ! 2,539 square feet 5 bed 2.5 bath 2 story 2 car The Lombardi is a two-story, 2539 square foot, 5 bedroom, 2.5 bathroom, 2-car garage layout that will cater perfectly to larger families. The inviting entryway opens to the dining area which flows into the large eat-in kitchen and spacious living room. Just off the living room is the master suite which features a separate tub and shower and a large walk-in closet. and more !"